Locals in the Parkersburg, West Virginia area, or those who can make the trip: come to our ornament making party on December 9. Meet new friends and relax for a few Saturday morning hours—and you will make sparkling Christmas ornaments to give as gifts or hang on your own tree. Details below. AGES: No age limit but guidance may be required for small children since there these are glass ornaments. The Kreinik website is experiencing some technical issues right now. So sorry for the inconvenience as some pages are not accessible. We are working on a fix. UPDATE: website fixed and back up, Friday 1:00 p.m. 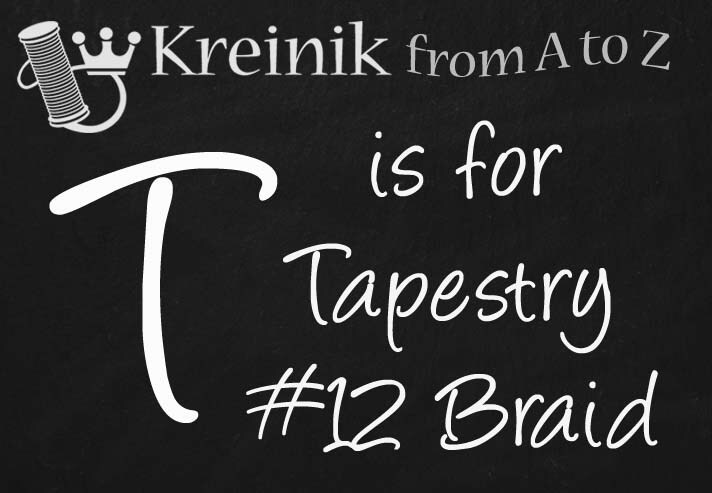 In your year of becoming a Kreinik thread expert, this week’s lesson is: T is For Tapestry #12 Braid. This little power-house of a fiber is one of the most popular Kreinik Braid sizes for needlepoint, giving perfect coverage in tent stitch on 18-mesh canvas. 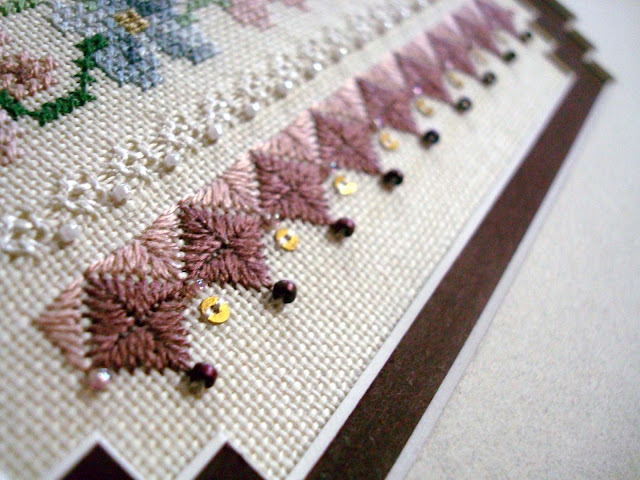 Beyond needlepoint, it is used in bead knitting, bead crochet, embroidery, and weaving, among other fiber art techniques—even fly fishing. Here are 12 facts about #12 Braid that will impress your friends and influence people (or at the very least, improve your stitching and fiber knowledge). 1. It was created specifically for ideal coverage on 18-mesh needlepoint canvas. At the time, the trend in needlepoint was full coverage, and Fine #8 Braid was too thin for that. With Medium #16 Braid feeling too thick for 18-count, designers asked the Kreinik family to create an in-between size. Tapestry #12 Braid was born (and named Tapestry, aka needlepoint). 2. It comes in more than 200 colors. Your favorite colors in Fine #8 Braid or Medium #16 Braid are also available in #12 Braid. The range is unparalleled in needlework threads, with solid, variegated, antiqued, holographic, and glow-in-the-dark options. Want a home reference? These colors are shown in the Kreinik Metallic Color Card or Kreinik Metallic Thread Color Chart (free download here). 3. It can be varying thicknesses. This is a tricky aspect, but good to know: some colors such as the Cords, Hi Lustre, Holographic, Vintage and Glow In The Dark can be a wee bit heavier than the basic metallic colors. If they appear to be too thick to you when using these special-effect threads, just go down a thread size (to #8 Braid). 4. It comes on 10-meter spools or cones of any size. Doing a large project and want to make sure you have the same dye lot? Simply special order a cone from your favorite needlework store. We can cone any amount. 5. If you use a holographic color, the end is going to fray. It’s the nature of the beautiful beast. That is, holographics are unsupported fibers, so the ends tend to go loosey-goosey when braided. Simply use a clear nail polish or dab of glue on the ends to bind them together before stitching, sewing, weaving, etc. 6. 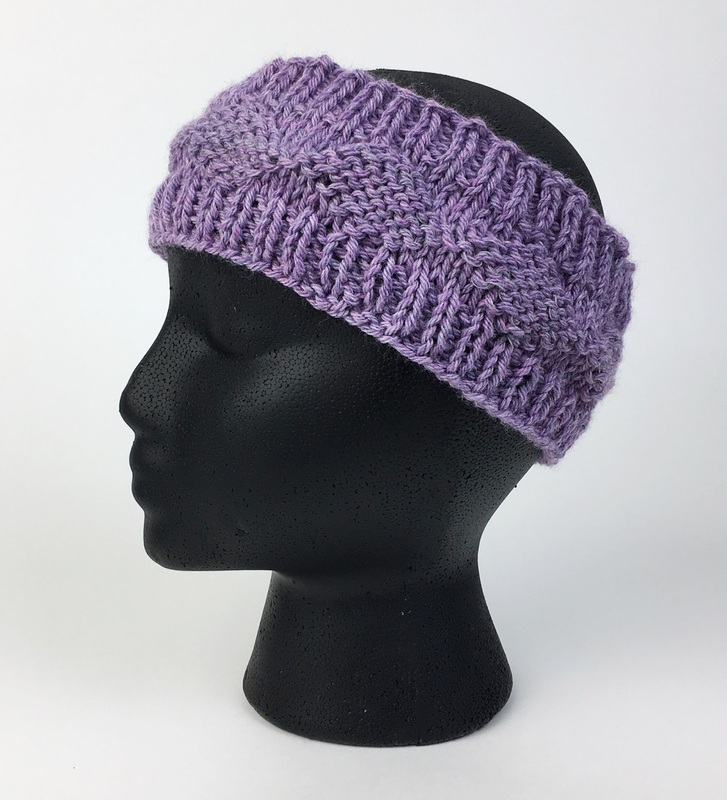 It is available in an overdyed version. The fabulous company ThreadWorx makes 80 of the dreamiest variegated shades of Kreinik Tapestry #12 Braid. See them here. 7. It’s made in West Virginia. Yes, we make it in the Kreinik factory in Parkersburg, West Virginia. In fact, we’re making some right now. 8. 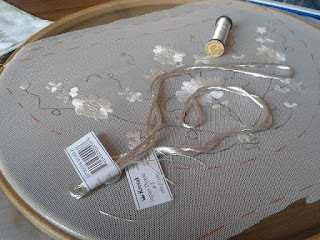 It’s a cross-stitch thread when used on 11-count Aida. Use one strand, straight from the reel, on larger fabrics like 11-count Aida, or unusual fabrics like screens. You can get your favorite colors of Very Fine #4 Braid in this size too. 9. It’s the perfect weight for bead knitting. Translucent beads are even more beautiful with the metallic braid running through them. Search “Metallic Tapestry #12 Braid” on Revelry to see gorgeous bead knitting creations. Many of Earth Faire’s Bead Soup and Bead Stew projects feature #12 Braid. 10. You can crochet with it. Considered a super fine weight, it makes beautiful crocheted Christmas ornament designs. Use it alone for jewelry, appliqués, and other accessories., or add beads for bead crochet projects. Share your experience with Kreinik Tapestry #12 Braid here or on Kreinik’s Facebook page. If you’ve never used it, get a spool in your favorite color and give it a try. It’s simply another thread size to have in your coloring box of fibers. Tis the season to be thinking about holiday gift giving. It's always good to give something handmade —it's unique, created with love, one of a kind, personal and meaningful — but there's only so much time in a day, right? 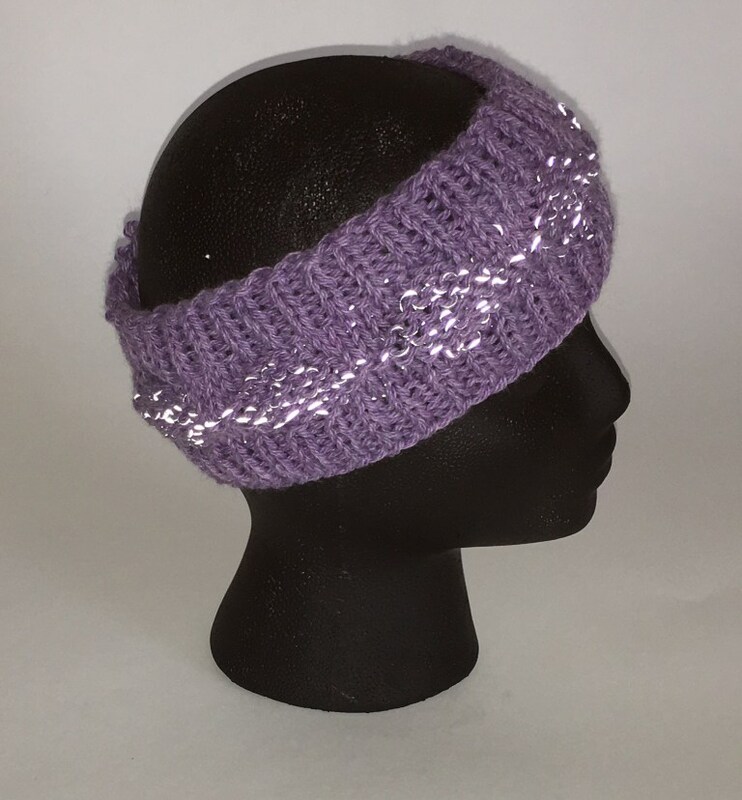 So go for quick projects like this one, Reflective Diamonds Ear Warmer, a free pattern from Mary Beth Temple of Hooked For Life. Knit this headband in a favorite color; the neutral gray Kreinik Reflective Yarn will blend into anything. What, you haven't heard of Reflective Yarn? If you knit or crochet, you have to try it. Not only is it fun (think of adding subliminal motifs, words, or messages), but it adds another level of safety to items worn in the dark. When the light hits it (like a flash or car light), it reflects. Great for knitted or crocheted dog sweaters, plus hats, scarves, gloves, etc. Side note about the Reflective Yarn: you can also stitch with it. It's about the weight of our Fine #8 Braid. Go ahead and needlepoint with it for belts, shoes, handbags. You can also use it on 14-count Aida in cross stitch or in embroidery on clothing. Turn your radio on…er, rather, your iPhone, iPad, or computer and visit with the man who makes the threads you’re using in your cross stitch, needlepoint, weaving, crazy quilting, fly tying, fiber art, mixed media, or embroidery project. It’s a podcast called Fiber Talk, and this week’s guest is Doug Kreinik. Fiber Talk is a fireside chat with fellow stitchers, a peer into the people behind your favorite designs, threads, fabrics and more. It’s the podcast for people who play with needles, people who love people who play with needles, or people who want to play with needles. That’s how hosts Gary and Christine, both needleworkers, describe their fun show. It airs weekly, interviewing needlework designers, company owners, and other interesting fiber people. We’re thrilled that they asked to interview Doug. Kreinik threads give stitchers “a whole other avenue of creativity,” as Christine notes in the podcast. The hour-long interview turns into a fabulous discussion on threads, family, the industry, and everything in between. Hear about Kreinik’s 100-year-old machines, where the idea for the threads came from, what actually happens at the factory, and more. 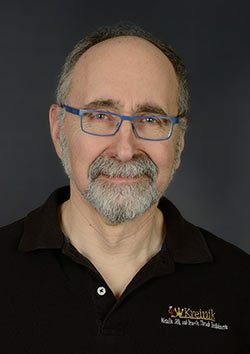 Enjoy your visit with Doug Kreinik! We want to let you know that Kreinik color 002HL has a slight dye lot change that will be taking effect in the next few weeks. The new 002HL is still beautifully brassy, but just a bit darker in shade. Unfortunately, dye lot changes happen periodically. They are the bane of any fiber maker. We hate the thought that a project-in-progress could be ruined by a color change. We always recommend buying enough thread at one time to finish a project to avoid dye lot issues. In the day of bargain thread sales on ebay or yard sales, or even with shops (or Kreinik) clearing out old stock, there is always a risk that a color may have changed—and that applies to any fiber, any maker, any brand. We regularly label the dye lots on our Silk Mori, but have never done special designation on the metallics. Stitcher Donna suggested we start identifying dye lots with the metallics, and we agree. So when you receive the new 002HL, spools will have an extra marking above the size; in this case, the letter “B” designating a dye lot difference. From now on, a stand-alone letter on the label It will be shown on any metallic experiencing a dye lot difference. We are so sorry for the inconvenience of the change in 002HL. It won't be drastic, but it may be noticeable if you are stitching a project with an older spool. We're opening our doors for a mega fiber sale. Treat yourself and your friends to the 3-day event at the Kreinik factory outlet store October 5, 6, and 7, 2017. The sale is located right at thread central: 1708 Gihon Road, Parkersburg, West Virginia. There truly is a treasure at the end of this road trip! 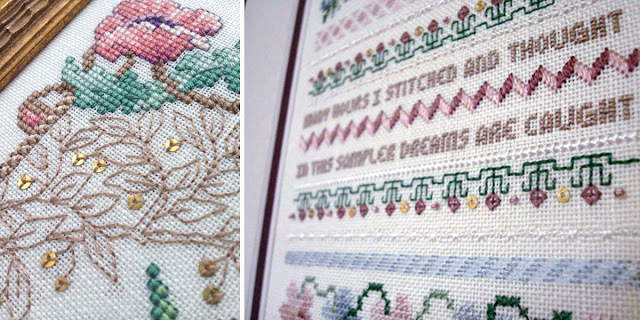 Sampler lovers will find special silk threads to make their projects truly unique. 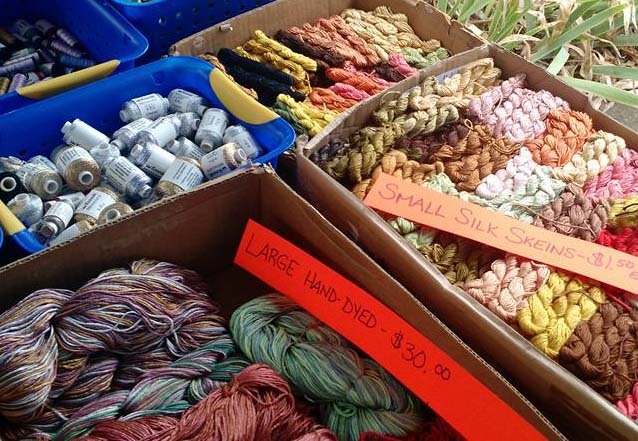 Quilters, spinners, and fiber fans will "dig" the deals of Kreinik thrums and bits. Weavers, knitters, crocheters, and fiber artists will find coned metallics at sale prices—a good buy for needlework finishers and needlepointers working on large projects, too. We will have discount prices on fabrics for cross stitch and counted thread (yes fabrics, extra stock from kits). If you're a fan of Tokens & Trifles, the perforated paper shapes produced by Redefined, Inc. a few years ago, all that remains will be sold off at this sale (we know; we loved them too! Get yours before they're gone forever). Q: Why have a special 3-day tent sale? 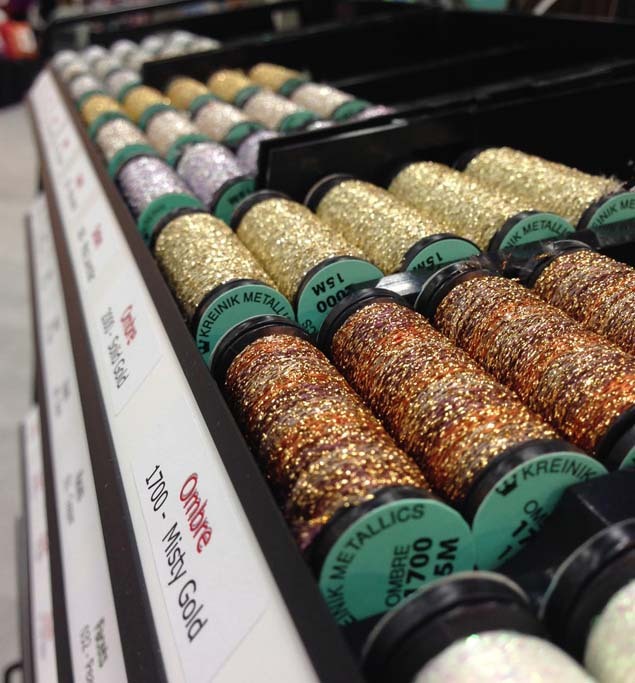 Doug: We experimented with a Kreinik Factory outlet sale last year and in the spring. The response was overwhelming. People want to visit and really enjoy digging through treasures, finding must-have stash items. Q: What can we expect to find at the sale? Doug: Fun!! Also, the chance to meet new people, other stitchers, weavers, cross stitchers, needlepointers and fisherman. Q: Will we get to tour the factory? Doug: If I am around, I have been known to give tours. Fiber people always have questions and the more you know, the more interesting the product and company. Q: When we visit Parkersburg, where should we eat? Doug: I have favorite restaurants and hotels in the Parkersburg area. Most represent global cuisine: Lebanese, Puerto Rican, Philippine, even some down-home cooking. If you are into history, there is also a lot to see within a 25-mile radius. Blennerhasset Mansion, where conspiracy grew with Aaron Burr, plus the Indian Burial Mounds of Marietta, and the oil and gas museum showing the birth of an industry. 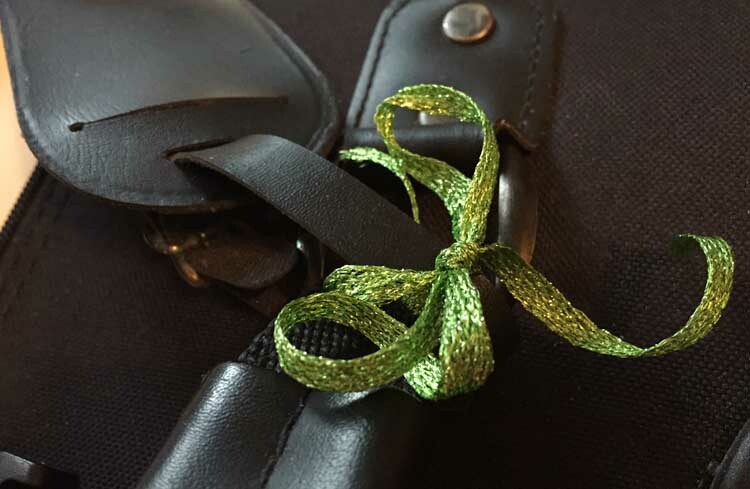 A few special details are still being planned, but there may be some make-it-take-its, and a chance to make your own custom shoelaces out of Kreinik threads. You're just going to have to join the fun. We'd love to meet you. Dates are: October 5, 9 a.m. to 4 p.m.; October 6, 9 a.m. to 4 p.m.; October 7, 9 a.m. to 3 p.m.
Products at the tent sale will not be posted online, so you have to come! lesson is: R Is For Ribbons. 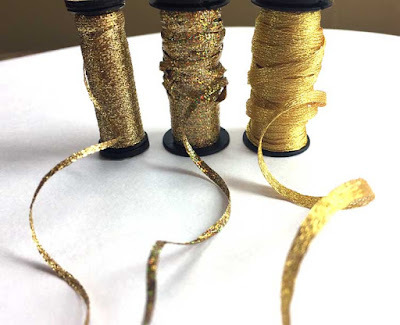 They may not be as well known as Kreinik Braids, but Kreinik's metallic ribbons are staples to many needle artists and growing in popularity among younger stitchers. Why; who stitches with ribbons? Let's find out. A few decades ago, ribbon embroidery on denim was hot. 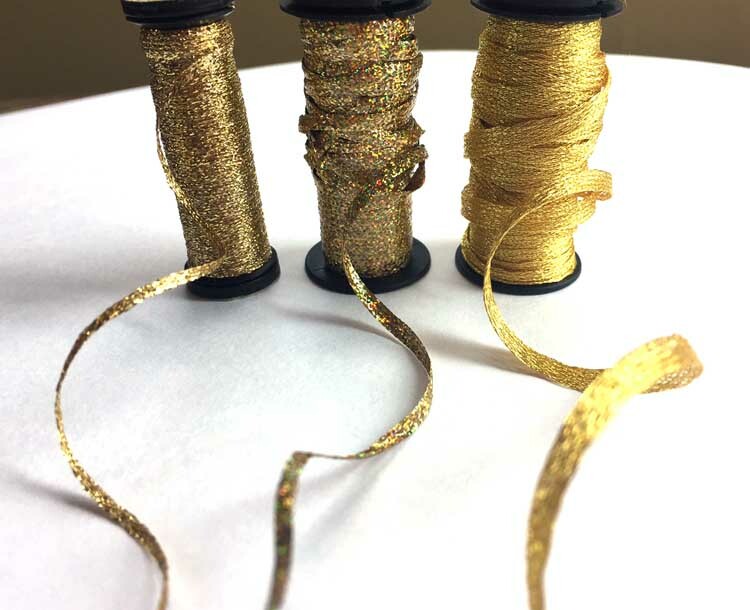 Kreinik and Leisure Arts published a "how to use metallic ribbon in embroidery" booklet that was popular. Fast forward to today, and embroidery on clothing is back, albeit in an updated style and on different fabrics. 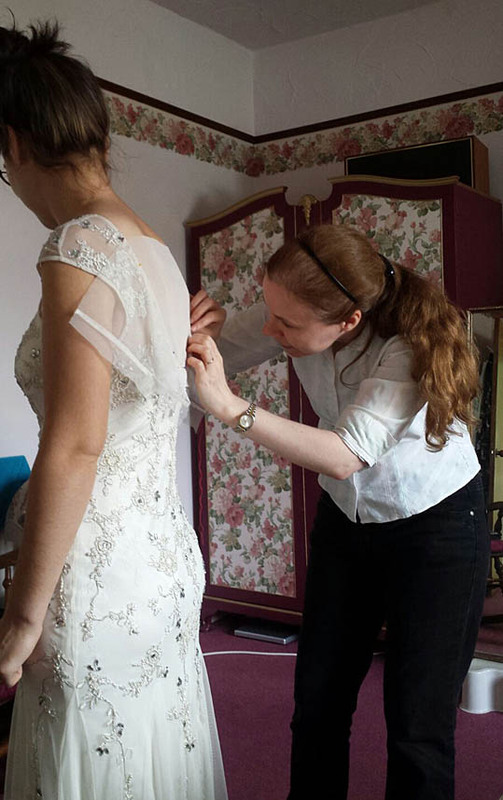 Embroidered costumes—like the ones by Michele Carragher in Game of Thrones—are in demand. The more embroidery in general grows in popularity, the more stitchers seek out a variety of threads to make their designs dimensional and interesting. Kreinik 1/4" Ribbon, for instance, was created by request from Japanese embroiderers who wanted a wider size. 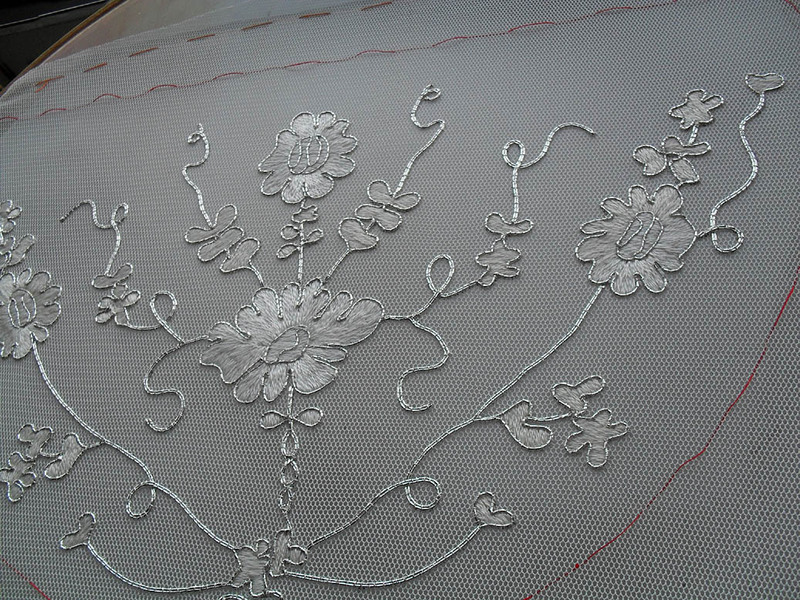 It is now used in general embroidery for specialty stitches like woven spider web roses and other flower stitches. The draw of stitching with a ribbon is the flat texture. 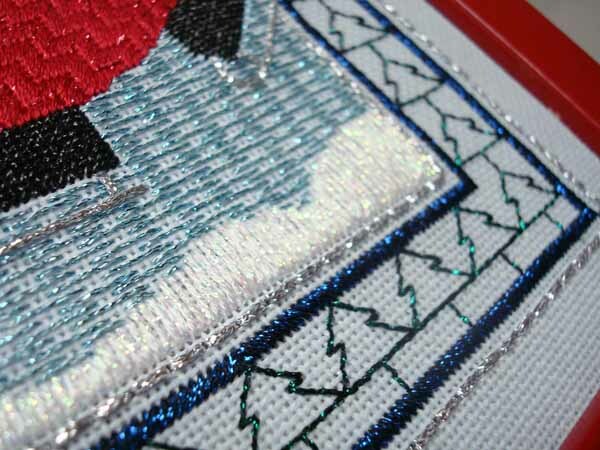 When used in needlepoint, a metallic ribbon gives you maximum light reflection. Needlepointers have found that Kreinik 1/16" Ribbon gives great coverage in tent stitch on 18-mesh canvas, while Kreinik 1/8" Ribbon is good on larger mesh. Couching techniques use the wider 1/8" Ribbon for layered stitches. The way we make the ribbons—a woven braid, if you will—means they are flexible and move easily into any specialty stitch. The flat ribbons have been used to stitch plastic canvas projects for years because they cover so beautifully and give a smooth look. Young stitchers are picking up this medium as an alternative to cross stitch fabric, and finding the need for fibers that cover the edges. Both 1/8" Ribbon and 1/4" Ribbon work perfectly on plastic canvas. Yes, you can cross stitch with a flat ribbon like 1/16" or 1/8" Ribbon, even on the traditional 14-count Aida (just use a larger needle). It makes an interesting border when worked in giant "X" formation. Also, as people are looking for more unusual items to stitch on, such as screens, pegboard, chairs, etc, the larger size such as 1/4" Ribbon covers nicely. The pop of color from the metallic, and the flat surface from the ribbon combines to make a stand-out design or stand out area in a cross stitch design. As people expand their creative passions into felting, sculpture, weaving, machine embroidery, and other fiber arts, they are mixing materials to make things more interesting. There are no rules to this kind of creativity, which is exciting. They depend on a variety of textures, finding flat ribbons to be ideal companions to round yarns, stiff real metals, round hardware parts and such. It all works together to make any fiber art more dimensional. If you're mate's a fly fishing fan, you may have noticed them stealing some of your metallic threads for their lures. Fish love the sparkly stuff. The ribbons are used for wrapping, bodies, and wings. Shred the ends a bit to make the thread ravel (use this technique in needlework too, for interesting stitches and fuzzy texture). There are so many other uses for flat metallic ribbons, the options are truly endless. They are great in tassels, as bookmarks, as decorations in hair styles, wrapped around bouquets, luggage identifiers, and ornament hangers. The sparkle adds elegance when anywhere. They offer color, shine, a flat texture, and a 3-D touch. As with many of you, we have been thinking and worrying about our friends and family in Houston, Texas, and surrounding areas since Hurricane Harvey began late last week. 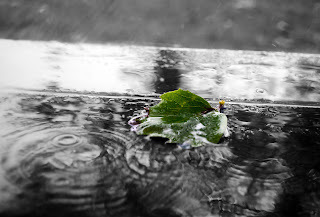 Our hopes, prayers and wishes, like yours, are for everyone to be safe, and for relief from the floodwaters to come quickly. The needlework industry is one big family. Stitchers, shops, designers, and teachers in the devastated area, reach out to us and your needlework friends. Our hearts break for your beautiful city, its people and pets. "It absolutely is worse than it seems," says stitcher Tara on Kreinik's Facebook page. For all of our designer and teacher friends in the areas, you are in our thoughts and hearts. Check in when you are able. Kreinik will be a vendor at the upcoming Destination Dallas needlepoint market (wholesale only). We hope to see you—and hug you!—there. How do you iron metallic threads? You finished your cross stitch or embroidery project and it looks fabulous! Except for the ring indentations left by the embroidery hoop, or creases still visible from the folded fabric. Now what? 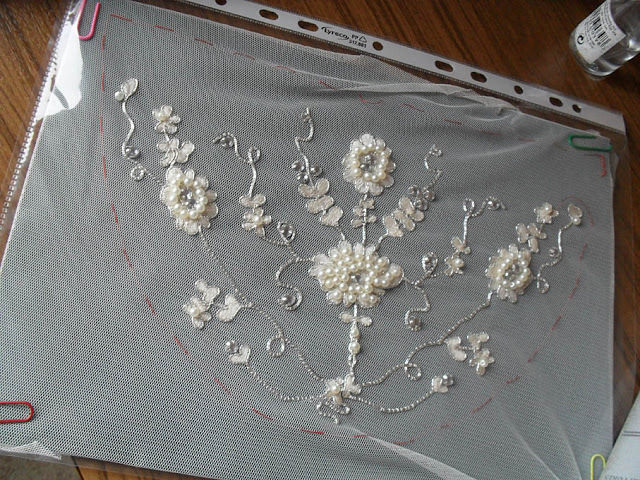 We want our needlework to look absolutely stunning, right? When all is stitched and done, how you treat your stitching will make a difference in how long it lasts and how good it looks. So this is an important step in any cross stitch or embroidery project. 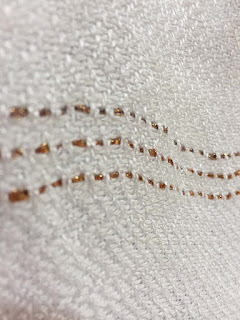 Let's take a look at the potential problems that can happen when you finish stitching, and solve one of the most frequently asked questions: how do you iron metallic threads? We hope you've kept your hands clean as you stitched, and away from dust, spills and similar. Barring any spot clean-up you may have to do, you may want to wash that project any way. Unseen oil on skin, for instance, will show up in the fabric over time. 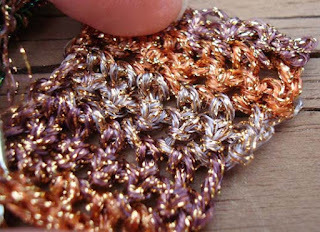 The good news about your favorite metallic threads: you can hand and machine wash Kreinik metallic Braids and Ribbons. Hang to dry or tumble dry on low. The potential problem in washing: bleeding colors. There are some colors like red that are notoriously not colorfast. 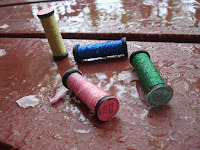 In the Kreinik thread line, colors 003L and 006HL may bleed. Stitch a test swatch and check colors in water (that applies to cotton floss too) just to make sure. 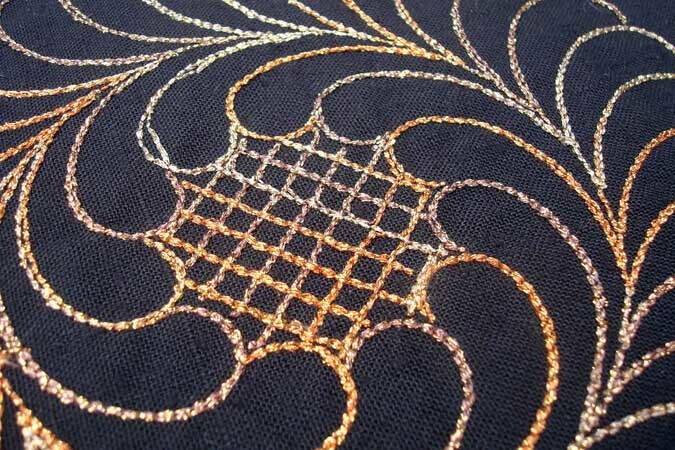 Yes, you can iron Kreinik metallic threads, BUT use a press cloth. 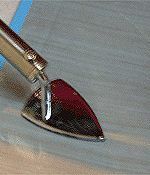 Do not place the hot iron directly onto the metallic, as the thread will melt or shrink. Most metallic threads are synthetic, made of polyester and/or nylon, and they don't like high heat. What is a press cloth? Place your needlework on the ironing surface, cover it with the press cloth, then press with your iron (large home iron or craft size iron). Reposition the cloth as needed to press your project. Do not use steam on the metallic area. If using fabric as your press cloth, wash it first to remove any sizing, and make sure it is white, not colored. If needed and desired, dampen the fabric slightly instead of using the steam setting on your iron. The benefit of a nonstick press cloth over fabric: it will last longer and be easier to clean. Also, it's ideal for ironing other items like fusible appliques, interfacing, hem tape, etc as it will keep the adhesive from gumming up your iron. Side note: should you place your needlework face down on your ironing surface, or face up? Basic cross stitch designs can be ironed face up (with your press cloth on top). 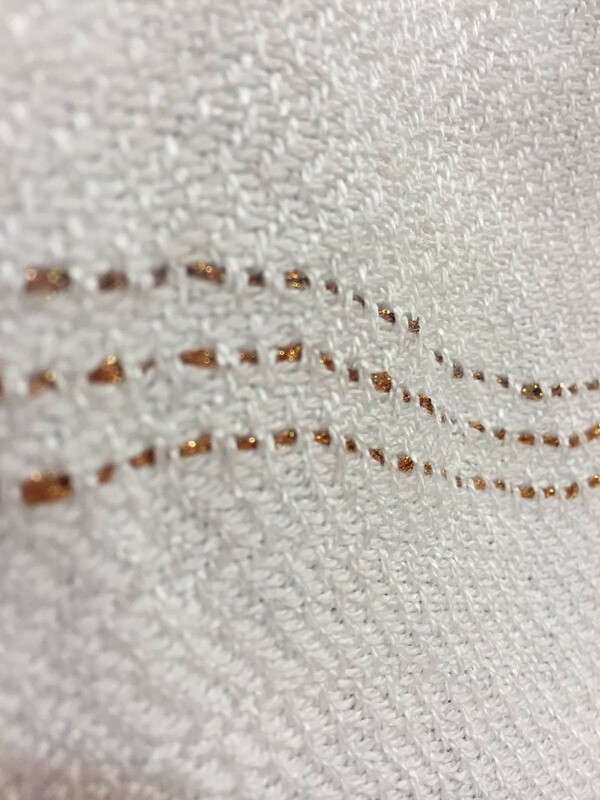 If using dimensional stitches like French knots, however, put your needlework face down onto a towel or padded surface, cover with your press cloth (metallics are on the back of your work, too! ), and press; this will keep your iron from flattening the stitches. Get a press cloth and keep it with your cross stitch and embroidery supplies. You will always be ready to finish your beautiful project the safe way, to keep it looking fabulous for years to come. This go-betweener will protect your embroidery and threads—regardless of their content—from potential damage from an iron. 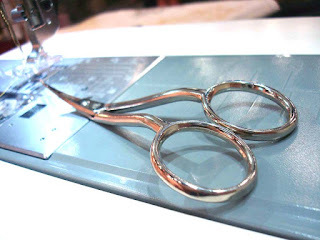 We have 45 years of experience with scissors here at Kreinik. We cut a lot of thread daily. Just like you, we lament when our scissors go missing, complain about dull cheap scissors, and we collect them. When it comes to cutting thread, fabric, paper or anything, the right scissor makes the job better and easier. Everyone deserves better, easier, and happier stitching. Early in the company, Jerry and Estelle Kreinik sold their favorite scissors alongside their metallic threads. They carried several brands over the years, more recently with Doug Kreinik bringing in the Premax line. Why this line? Well, we do love all things Italian (they are made in Premana, Northern Italy), but they are also just really really good scissors. Like, really good quality. That round circle does more than resemble a cute little bird's eye; it means that the scissors won't get loose like scissors with a screw. So technically yes, they are superior scissors, but they are also charming and unlike any other scissor out there. A sort of wavy svelte profile offering a lifetime of cutting greatness—yes, please! This is a sharp little work-horse scissor that will meet all of your cutting needs as you sit and stitch at home or in class. The best part, however: purple handles! The regal color is as pretty as a flower and just lifts your mood. It's a classic color that will never go out of style. Some recommend that you use a serrated blade for cutting metallic threads. This blade, as opposed to knife-edge, has "teeth" that hold the thread in place as you cut. Serrated blades are often used in sewing for cutting slippery fabrics; the "teeth" help grip the material during the cut. Serrated scissors from Kreinik/Premax will have an S in the item number. If you're idea of sequins is more "Las Vegas" than "History Museum," we want to introduce you to Paillettes. These real-metal orbs will add elegance, classy detail, and a touch of history to your needlework designs. Far from flashy, these embellishments are about as sophisticated as you can get. Even better: they aren't expensive, and they are easy to use (easier than beads! they don't roll around!). Let's talk about paillettes, part of the Kreinik embellishment line since the 1980s. What are these magical orbs? Why use real metal sequins in your needlework? Where can you get paillettes? These embellishments come in a variety of sizes, most often in gold or silver. You can buy packages of paillettes for a few dollars. Most are sold by weight, as in 1-gram packages. Note: the larger the paillette, the fewer you will get in a package (larger weighs more), so when you order a size, check to see how many you will get. If you are working on a design, try to count or estimate how many paillettes you will need. Will they tarnish? As with any metal, they can tarnish over time but respond well to polishing. 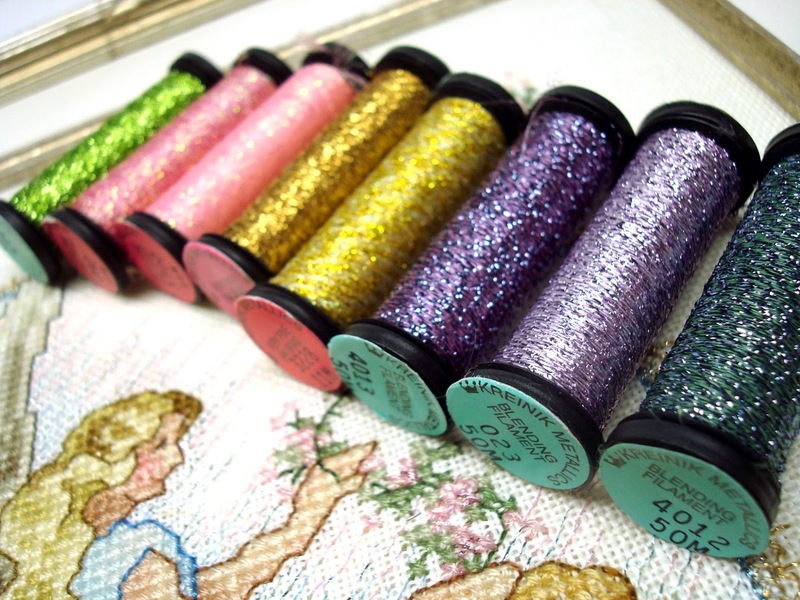 Kreinik's paillettes are ecclesiastical grade, meaning they are treated to prevent tarnishing. Will time ruin embroidery made with paillettes? Not if the textile has been taken care of, ie, not exposed to the elements, not washed (dry clean if necessary), etc. 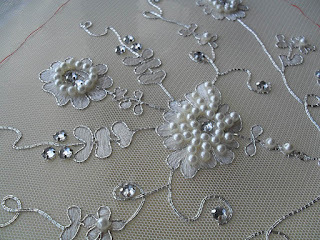 Treat the embroidery like the valuable textile it is, made from your valuable time and creative dreams. Have no fear about working with them. If you've been wanting to experiment with real metal threads but are intimidated or not sure where to start, start with paillettes. They are easy to use and will get you hooked on the look of real metal embellishments. Can you think of places to use them in a design you're stitching now? 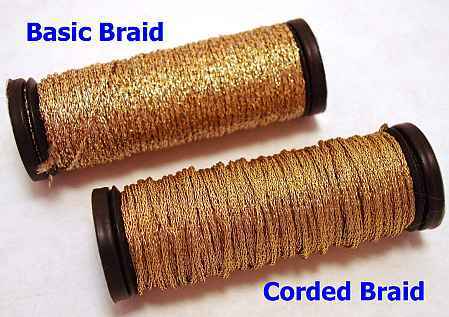 How is Braid Made at Kreinik? Ever wonder how we make Fine #8 Braid or Very Fine #4 Braid? Now you can get a glimpse of never-before-seen action at the Kreinik thread factory. Enjoy this behind-the-scenes video by Kyle Sams showing how Kreinik Braids are made. Every day, a group of dedicated staffers transform raw materials into your favorite metallic threads, then ship the spools and cones to stores all over the world. Thank you for using Kreinik to make your cross stitch, needlepoint, weaving, knitting, crochet, fly fishing, tatting, Temari, paper crafts, mixed media, fiber art—all techniques!—come to life. Right on the heels of the season debut of Game of Thrones, in which Kreinik threads are used by costume designer Michelle Carragher, we're excited to announce that Kreinik is behind another exciting tv venture! Well, sort of... Pardon us while we brag a little bit. 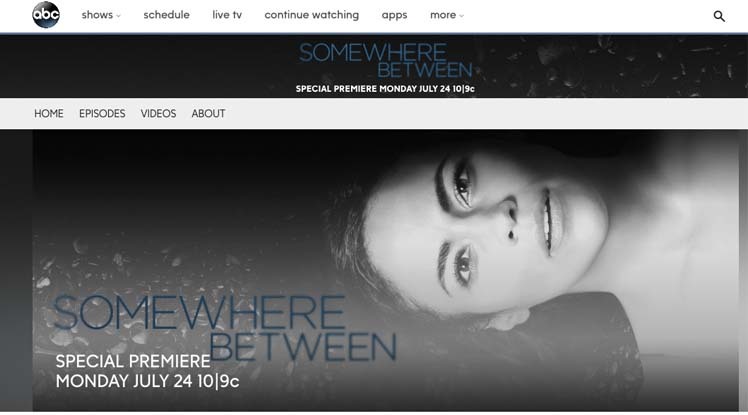 Danielle Kreinik—daughter of company owner Doug Kreinik, granddaughter of founders Jerry and Estelle Kreinik, past part-time helper, and always creative input-er—is co-producer of ABC's new summer series "Somewhere Between." The show premieres this coming Monday night, July 24, 2017; check your local ABC channel for time. ABC describes the drama/thriller show this way: "Paula Patton stars as Laura Price, a local news producer in San Francisco helping the police to hunt down a serial killer. After the killer strikes close to home, a twist of fate allows a "Groundhog Day"-type reset, and Laura relives the week prior to the string of murders. Unlike "Groundhog Day," she only has one chance. Can she change fate and stop the killer?" After growing up surrounded by threads, textiles, and artists, Danielle earned her degree in Opera from Indiana University, and then moved to Los Angeles. She has worked as an actress, script reviewer, developer and producer. From idea to development and then production, Danielle has been working on this show for some time, so it is exciting to see it come to the screen for everyone to watch. Danielle actually found out that the series was picked up by ABC on the day her son was born. Our Kreinik baby is growing and smiling and charming the world, and the show is finally premiering too. In your Year of Becoming A Kreinik Thread Expert, it's time to learn about this unique thread: Kreinik Ombre™. You can use it in needlepoint, samplers, weaving, knitting, crochet, embroidery, cord making, Temari and bobbin work, among other techniques. 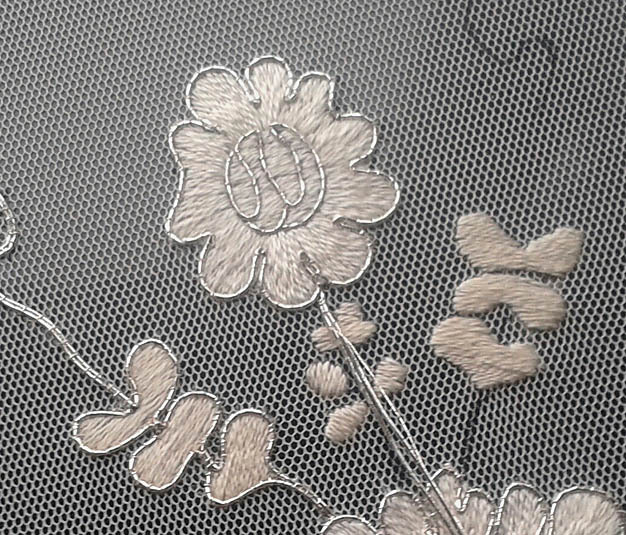 It's a loosely twisted metallic designed to give a loosely woven effect in needlework. The core color range is variegated, going along with the origin of the word, which gives you interesting color effects. The word "ombre" in general refers to the gradual blending of one color hue to another. The color effect is popular in hair styles right now, as well as fashion (skirts, shirts, handbags), home decor (pillows, window treatments), and even nail polish. In needlework, the Kreinik thread Ombre is best used in specialty stitches such as Satin Stitch, Herringbone, and others that show off the loose twist and the variegated color. It was one of the first non-Braid threads Kreinik made back in the company's early days, and was particularly popular when machine knitting was in vogue. Since the unique texture of Ombre became so useful to stitchers for creating various effects, the Kreinik family started making it solid colors as well as variegated. Ombre offers you a unique thread with elegance and texture. 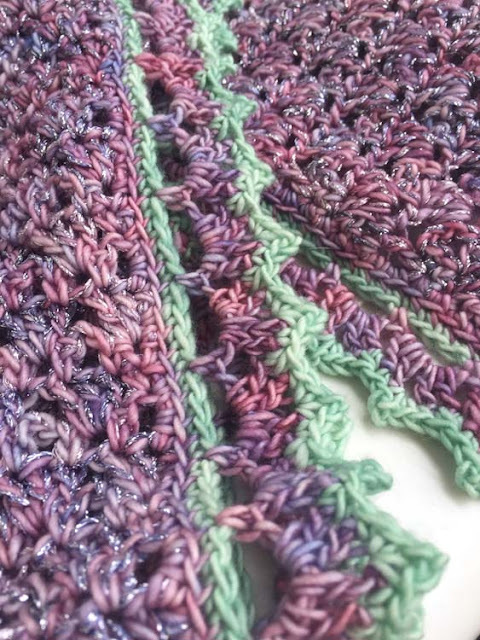 Get at least one solid color (we love 3200 Pearl for snow and 2000 Gold or 1000 Silver for Christmas) and one variegated color (1600 Misty Lavender is popular) to start experimenting in your projects. Read on to learn more. Why would you want a loose twist? It creates a stitch that "lifts" off the surface of your canvas/fabric, creating added loft, texture, and dimension. In knitting and crochet, it gives you a metallic look but in a super-soft thread. It is one of the softest metallics you'll ever feel. In needlepoint and counted thread, it gives you a unique, fluffy texture—imagine snow drifts, jacquard fabrics, and other "risen" effects. Why would you want a metallic? 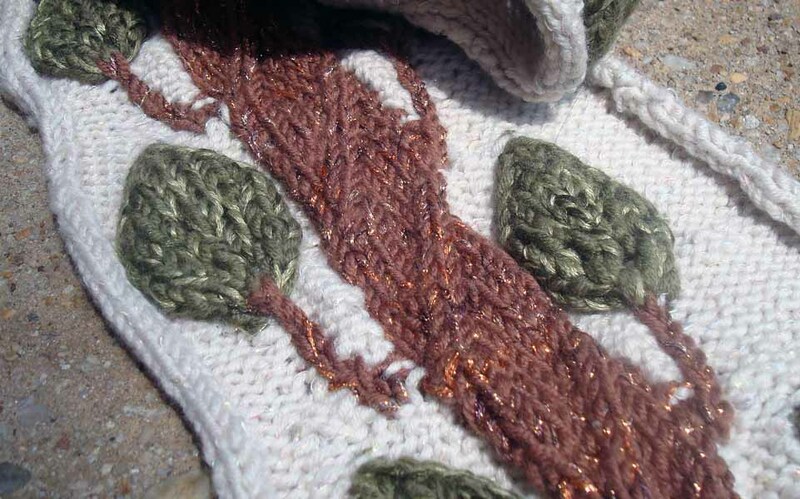 In hand stitchery, use it straight off the reel, with a #22 Tapestry needle or a #18 Chenille needle; longer or decorative stitches are best for showing off the fuzzy texture or variegated color. In crochet and knitting, use it as a carry along to dress up alpaca, cotton, wool, silk or any yarn. In bobbin work, use a coordinated color of #60 or #80 cotton, mono, or rayon thread in the top; makes lovely raised, nubby effects in particular with zig zag and decorative stitches—lengthen stitch length slightly. Lovely in digitized embroidery designs or programmed machine stitches (looks like you have stitched with glitter). Share how you use Kreinik Ombre in your projects. We'd love to hear and see! We'll be back Monday, July 10, 2017. See you then! Keep stitching and creating. Now is a great time to get organized for holiday stitching, make lists of the Kreinik threads you need, find a needlework store to visit, or simply enjoy making things during the long summer days. We'd love to hear about your summer projects when we get back. Have you ever been asked—or taken upon yourself, as your own idea—to do an important piece of needlework, one of significance, maybe even historical or memorable importance? As stitchers, we may have a talent unique among our communities, or we have friends who know the value of our handwork and want a memento from us (as someone would want a painting, quilt, or piece of furniture). What if the embroidery request challenged your skills by encompassing something you've never done? Whether you jump right in or struggle with your confidence as you start, a commission or special project is worth it. Blogger and stitcher Elizabeth Braun (http://sew-in-love.blogspot.com/) worked on such a project, making an embroidered panel for a friend's wedding dress. It's an embroidery adventure full of meaning, love, and embroidery tips to which we can all relate. Read on as we interview Elizabeth about the project. Q: We describe this project as an "embroidery adventure." Have you ever done anything like this before? ELIZABETH: No, this was a completely new type of piece for me. I’d made a ring cushion before, but never done anything so much part of an important occasion as this. Also, it was my first piece of what one could call ‘couture embroidery’ as the only stitchery I’ve done on clothes before has been a few basic flowers on baby knitting projects. The other firsts for me were working on fine netting and using water soluble stabilizer. So, yes, ‘an embroidery adventure’ is a good name for it! Q: How did the project come about? Why did the bride want an embroidery panel? Even though it was never really meant to be seen, I wanted to make it as good as I possibly could, especially as I’d always been fond of Lauren and so loved the idea of doing something like this for her. Also, I’m a bit of a perfectionist and couldn’t really work with the idea of ‘just anything’. Oddly enough, I’d find that harder to achieve than a very precise design brief! 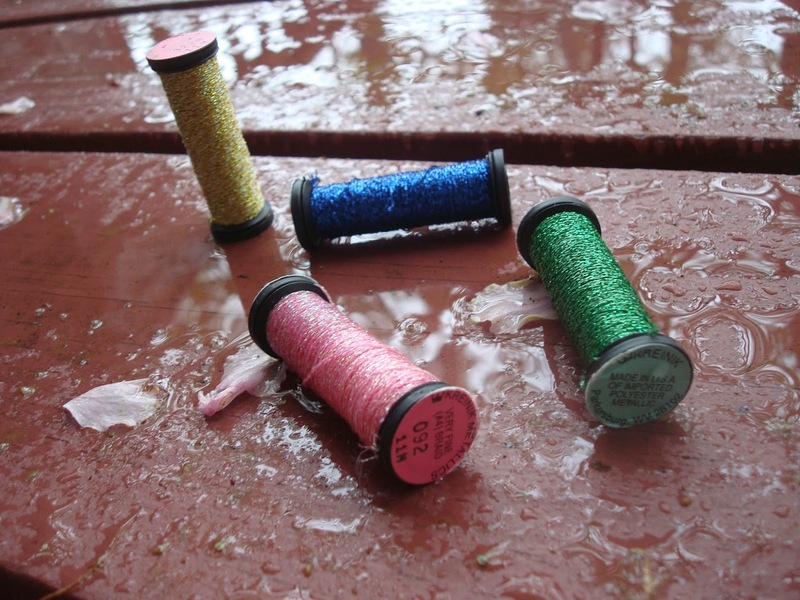 Q: Which Kreinik threads did you use? ELIZABETH: Japan threads in 001 (silver) matched the embroidery on the dress proper perfectly, especially the #7 thread which I used for most of the silver work – couched down with #1, as were the smaller lengths of #5 that lent themselves well to the detail in the larger flower centres. Q; What were the challenges—and solutions—to working on netting? ELIZABETH: Anyone who is used to working on loosely woven linen will have an idea of the difficulties involved. The netting was just a grid of tiny, cream hexagons and getting any sort of detail on it would have been almost impossible without stabilizer. Of course, unlike with something like linen, I couldn’t just back it with muslin or calico as the whole of that part of the dress was just embroidered net, so I used water soluble film to keep the whole thing straight in the working hoop and to allow enough stitches to be put in to make the shapes solid and stable enough. Stitching on this film was a little bit like embellishing a thin, plastic raincoat, it was rather an odd texture to work on! Once I had the design traced onto the net, (another challenge – getting enough ink on to the fine filaments of the netting so as to be able to see them clearly enough to work with), I mounted them both into a 10” hoop, keeping the stabilizer film fairly taut, but the net at its natural level of stretch bearing in mind the needs of the ‘end user’. Couching down the silver threads on net posed an extra problem as I needed to be sure to make each couching stitch cross one of the net filaments in order for the silver lines to be properly attached to the net. It would have been all too easy to have them hanging off in places. Q: Where, how, or when did you get started doing embroidery? 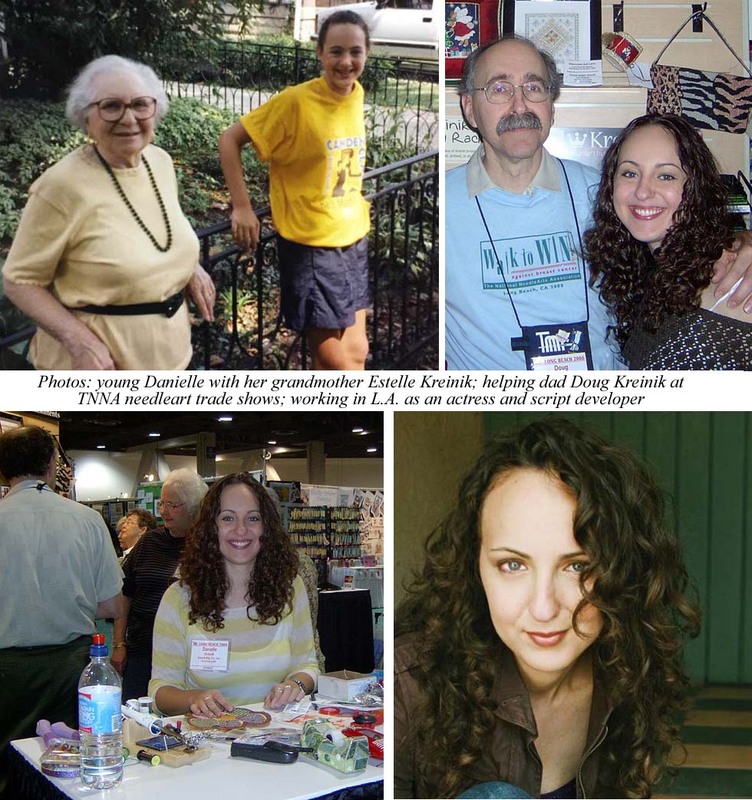 ELIZABETH: I did some small projects as a child, but got into embroidery as an adult when I was home with CFS back in 2002-2005. I needed something to do that would stop me feeling sorry for myself and, as I gave most of the things I made to friends, it also helped me to reduce the feelings of isolation so common with long-term conditions. A Taiwanese friend had arranged for her cross stitch magazine subscriptions to come via me after she went back, so I looked through some of them and decided to give it a go myself. It all started there and I’ve learned multiple techniques over the 15 years since then. ELIZABETH: Embroidery-wise at the moment I have a large cross stitch picture that I’ll be making up into a sofa scatter cushion/pillow in slow progress and I have another two projects hooped up to start – a rose thread painting and a meadow scene freestyle. Nothing with metallics at the moment, but I do use them in as many project as I can, because I just love the effect they give. Other than these, I’m busy knitting for the babies that are expected in my group of friends this summer and also making a start on knitting and sewing my own clothes for next winter. I need pretty much all new things and I want clothes that fit and that I actually love, so I’m going to do it myself. 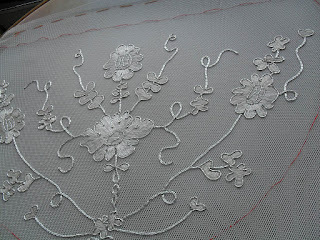 One or two will feature embroidery. 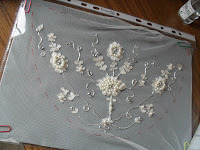 All the photos are copyright to Elizabeth Braun of Sew in Love Stitch Art, except the photo of tracing the panel (called ‘outlining panel’) which is courtesy of Janet Wellock, Halifax, England (i.e. 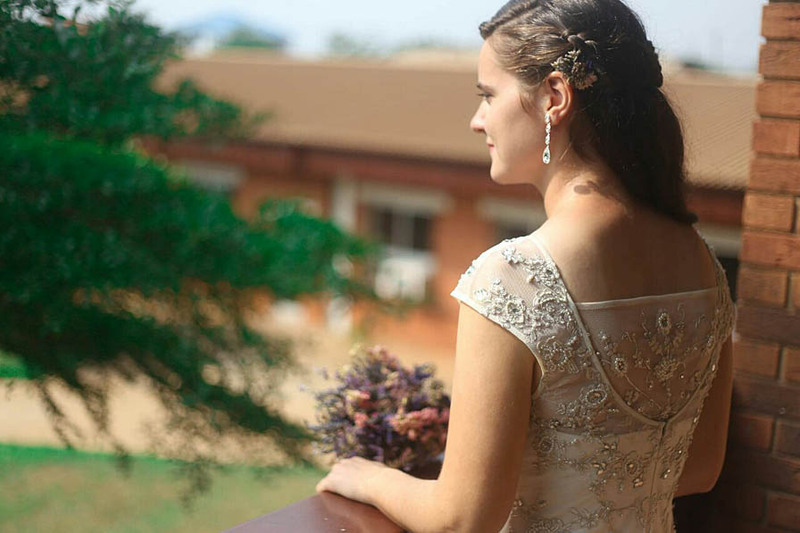 the bride’s mum) and the photo of the beautiful bride one which is courtesy of Leonard Adjei for Benkowsky Photography, Accra, Ghana. All used by permission.